CHICAGO – Linda Sorrell’s family has lived in this Near West Side neighborhood for decades. Her son, grandchildren, and six cousins have all gone to Victor Herbert School. Sorrell, like so many others in the community is dumbfounded why Herbert’s students will lose their teachers and staff in the massive school closure plan announced by Chicago Public Schools (CPS). Sorrell joined a group of teachers, parents and students April 9 and walked the mile from the school to Whitney Young High School to appeal the decision at a hearing of the Board of Education. About 30 people testified against the move. 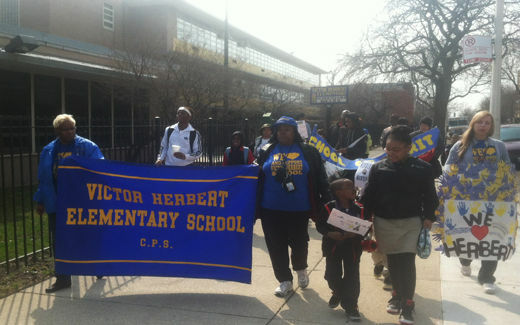 The action at Herbert is one of 61 school closures, mergers and turnarounds announced by CPS. It will be the largest number of school closures in U.S. history. CPS announced in May, 2012 that it would open 60 new charter schools over five years. The 355 students at Herbert are being merged with 205 students at nearby Robert Nathaniel Dett School. Herbert’s staff will be fired and replaced with the staff from Dett. They will have to reapply for their jobs. Sorrell was walking with her seven year-old grandson Germaine and some of his classmates. “I want it to be open so I can learn,” said Germaine, looking up at his grandmother. Herbert is located in a high poverty neighborhood in the Near West Side. Some 92 percent of students are African American and 93 percent come from low-income families. Over 30 percent of the student body has special needs. The school has two classes for children with severe autism and an Early Childhood Special Education program that enrolls three to six year olds. No one is sure what will happen to these programs. Rosie Clark-Scott has been a teacher for 28 years. She works at Herbert and is a member of the Local School Council. Clark reiterated the merger and firing of the staff would be a big disruption for the children and community. “We don’t mind cohabitating. But what’s the point of doing this. We have a library, computer and science lab,” she said. Noting that test scores are roughly the same between the schools, Clark questioned why the staff was being let go. “Our staff is highly regarded. We have educated generations of families. 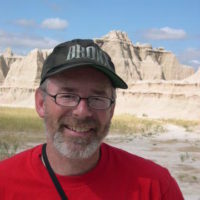 When there is a problem, they look to us for guidance,” said Scott. CPS officials say the reason Herbert is being merged with Dett is because of underutilization. The school is built for 810 students. But the underutilization standard is based on 30-36 children per classroom. Scott Hiley, a parishioner at St. Andrew’s Episcopal Church just up the street from Herbert, contested CPS’ claims that the school is underutilized. Saria Lofton is a nurse who works in Herbert and several other schools who is impressed with the children and how those with special needs have been served. “Is thirty kids in a classroom okay? Not really,” said Loften who described the school closing process as “cold.” She said it’s not going to be easy for special needs children to adjust to someone new. “This is a school community that has been created over 30 years,” she said. Loften also said school nurses have a heavy workload and are dealing with many health issues in the community including diabetes, asthma, allergies and mental health issues. “We’ve developed a team approach to these issues with social workers and psychologists and have implemented a lot of new programs,” said Loften. “We have no idea what will happen. Willie Williamson thinks he knows why closures are taking place on the Near West Side.